The management of the natural resources is important for the welfare of any country. In particularly agrarian societies, natural resources like land, water and forests played a significant role. Of late, the environmental degradation and destruction of natural resources like forests have attracted the attention of the scholars across the globe. The scarcity of the natural resources worldwide, which generated many conflicts in recent decades, has affected the quality of human life as well as the natural environment. This deterioration is not a recent phenomenon. It is a process evolved in history: in the forest policies and the economies that generated such policies. The study of these aspects is called environmental history, ‘whose principal goal has become one of deepening our understanding of how humans have been affected by their natural environment through time, and, conversely, how they have affected the environment and with what result’. In India too, whose economy is predominantly agrarian, people are dependent on its natural resources for their livelihood and sustenance. The management and utilization of natural resources like forests, land and water is crucial if viewed from the historical perspective. It has been observed by the historians that from nineteenth century onwards the management of natural resources have been increasingly brought under the control of the State. Though the government intervention was not unknown in the pre-British period, the major difference between the pre-British times and British period lies in the scale and magnitude of this intervention and the everlasting impact it has had on the society. As a part of reforms in the state administration taken up by Salarjung I, all matters connected with forests were delegated to the newly created Forest Department in 1867. Thus, a foundation was laid down for a ‘systematic’ development of forestry in the Hyderabad State. The Forest Department was under the control of Home Secretariat until 1881, and it was later handed over to the Revenue Department. The Conservator of Forests was the head of the Forest Department. The department was reorganized in 1914–1915 and the post of Conservator of Forests was elevated to the rank of Inspector General of Forests (IGF) with two Conservators under him. Under the IGF, there was a hierarchy of staff consisting of Conservators, Assistant Conservators, Rangers, Deputy Rangers, Foresters, Surveyors and Guards. The forest areas of the Hyderabad State were divided into circles, divisions, ranges, blocks and beats. In 1899, there were four forest divisions consisting of Warangal, Bidar, Gulbarga and Aurangabad. In 1901 they were increased to six with the creation of Mahabubnagar and Nirmal. In 1914–1915 the divisions were increased to 12 and were grouped into two circles, styled as Eastern and Western circles, each under the charge of a Conservator. This system continued until 1948. Each division was looked after by a Divisional Forest Officer (DFO) and the work of the DFO was controlled and supervised by the Inspector General of Forests. Each Divisional Forest Officer had a number of graded staff of assistants called Ameens/Darogas (Rangers), Sahradars (Foresters), Dafadars (Assistant Foresters) and Chowkidars (Guards). 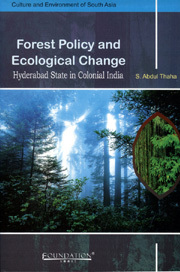 Forest Policy and Ecological Change: Hyderabad State in Colonial India is an attempt to highlight the history of forestry in colonial India in the context of the Nizams Dominions, popularly called the Hyderabad State. The ownership of forests by the State through administrative authority and its monopoly over the commercial exploitation of forest resources were central to the history of state forestry in the Hyderabad State. Since the government categorized forests into reserved, protected and open forests, the main objective for the forest administration was to conserve the existing forests and exploit them systematically. The management of the natural resources is important for the welfare of any country. In a predominantly rural country like India, where people are undoubtedly dependent upon their natural resource base for their sustenance, the management and utilization of natural resources like forests, land and water is crucial. As the increase in population and concomitant demands grow over control, use of natural resources makes resource-use patterns change. Though the government intervention was not unknown in the pre-British period, particularly from the nineteenth century onwards the natural resources have increasingly come under the control of the state. Many historians have noticed the significance of the state as a leading, often the influential factor in shaping the policy towards the management of ecological resources of India. Particularly, the second half of the nineteenth century is considered to be a period of ‘remarkable interventionist policies; an age of high imperialism and supreme confidence in the capacity of science and technology to control nature and utilise it to the maximum extent’. During this period various problems associated with forests, like irrigation, famines, drought and epidemics became the centre of attention. Concern is expressed over the above said environmental issues by experts in various fields. These disturbances in the ecosystem have led several scholars to reconstruct history, using insights derived from recent debates on environmental issues. The historical study of forestry and forest policies is relatively a recent phenomenon and one of the positive results of such concern has been the emergence of environmental history as a distinct field in the historical writing. It is a well-known fact that India from the eighteenth century onwards experienced a series of famines recurring at very short intervals bringing immeasurable sufferings and mortality. Different regions in the country were affected which brought disorder into the lives of millions of people. However, analyses of these famines by historians have rarely included the study of forest zones as the dependent source of sustenance during times of famine. It was overlooked that how forests protected people from starvation and death and how certain communities averted crisis and withstood drought due to their access to natural resources in forests. With the exception of one or two of these types of studies, many works on famines have neglected the impact of state forestry on the traditional methods of survival during scarcity, drought and famines. The present chapter makes an attempt to examine the history and nature of famines and scarcity in the Hyderabad State. In addition to this it endeavours to find to what extent people depended on forests during the times of crisis and the state response to the demands of the people during the famines. The Hyderabad State, in common with other parts of colonial India, was subject to periodical visitations of famine of a more or less severe character. The State had been witnessing famines since pre-colonial times onwards, which was a common occurrence, mostly due to the delay of monsoon rains. The accounts of famines in the Hyderabad State exist from the seventeenth century. Irrigation is one of the basic ingredients of agricultural activities. In the State of Hyderabad, where agriculture had been under the mercy of monsoon, irrigation acted not only as a stabilizing factor but also as an important production input in any agrarian system. The Hyderabad State lying in the subtropical area was always subjected to scarcity of rainfall and thus a great part of the country was open to severe famine conditions. The earlier rulers, realizing the importance of conservation, control and utilization of the waters flowing down many rivers and numerous streams, constructed many types of water harvesting structures. Tanks were the most popular ones amongst them. In fact tank irrigation had become by far the most predominant in the Hyderabad State, particularly in the Telangana region, where the rivers were not perennial and the country had to depend entirely upon the rainfall for its water. But the monsoon was generally confined to the few months of the year. Though normal rainfall was sufficient to increase the crop production there could be no assurance to the cultivation of both foodgrains and commercial crops without storing water for irrigation. The heavy sand content in the soils of the Telangana region also promoted the peasant to depend on this source of irrigation. In the trap region like Marathwada, deep and porous soil was not suitable for irrigation. Out of nearly 3000 sq. miles of the irrigated area in the State more than 70 per cent was in Telangana. For a long time, prior to the colonial period, forests had no commercial value to the rulers and the forest produce was predominantly consumed by the forest-dwellers and the peasants. Traditionally forests were conceived as an unproductive resource and the people living nearby the forests were allowed by the states to exercise their traditional customary rights. The Hyderabad State had also not shown any interest to conserve the forest resources till the middle of the nineteenth century. No forest policy was initiated when the Asaf Jahi rulers commenced to govern the Hyderabad State, nor it was realized as elsewhere in India that such a policy was considered necessary. With the exception of a few trees used for commercial purposes such as teak, the rural communities had free access to the forests. Forests were seen largely as an obstacle to the spread of cultivation rather than a valuable resource. Like their Mughals predecessors, the Asaf Jahi rulers also tried to push back the forest areas and extended the area under cultivation. The success of land revenue policy of the State was often measured in terms of extending the agrarian frontier. As a result of this agricultural expansion during the first half of the nineteenth century, the forest areas of Warangal, Adilabad and Karimnagar districts situated within the Godavari basin, had been repeatedly scratched up and excised under ijaras, banjars and pattas. The formation of the Forest Department in 1867 and the policies it enunciated had a far-reaching impact on the social, economic and ecological aspects of the Hyderabad State. Forest vegetation of the Hyderabad State was a part and parcel of the great deciduous belt occupying a large portion of the peninsular India. Till the middle of the nineteenth century, the State did not develop a ‘commercial attitude’ towards natural resources like forests. As elsewhere in pre-colonial India, rulers considered the right of the peasant is and tribal communities to utilize forest products. As the population was low, demand for forest recourses was also moderate and export of forest products was non-existent. There was availability of fuel, fodder and non-wood products in abundance for domestic consumption by local communities. It is generally argued that there was no significant evidence of conflicts over control of forest resources. It is in this context that the British government introduced changes at the all India level during the nineteenth century in property relations and state restrictions on the use of natural resources by tribal and peasant communities. With the construction of railways during the 1850s and 1860s, there was an increased need to meet the demand for railway sleepers and fuel and it is in this context that the Hyderabad State felt the importance of forests. The idea of inexhaustible forests gave way to the search for suitable strategies for control, conservation and commercial exploitation of forests. Meetings are a means of exchanging ideas, views, feedback and strategies. They are also the meeting ground for the field force and the management representatives, that is, you, the employees of the Head Office (members of the Product Management Team), the Zonal Office, and the Regional Office. As Field Manager, you are the most important representative of your team. To share the company's viewpoint, strategies, to review performance or to get important feedback, you need to conduct various meetings. In addition to these meetings you will also be conducting the doctors' group meetings or symposia. Therefore, organising and conducting successful meetings is an important responsibility of the Field Manager. The strength of these meetings will range from two or three persons of a pool territory to six or eight people of your full area. Remember that the success of such meetings depends upon how your team members participate in them. Do they do it out of compulsion or do they enjoy your company and that of the other members? Hence, in order to have meaningful discussions during these meetings, create an environment wherein every team member contributes freely without any hesitation. No MR can ever be ideal. It is your duty, as a Field Manager, to put in constant effort to make all your team members as closer to the ideal as possible. If you have to deliver sales, you must train your team members to become competent at delivering their targets month after month, year after year. You should also contribute to the overall development of your team members, which is possible only through continuous training. Therefore, as a Field Manager, you must train and guide your team members and help them develop in each functional area, to enable them accomplish their goals. have maximum opportunity to evaluate and develop their capabilities. The first step in training your team member is to find out his strengths and nurture them. At the same time you need to identify his weaknesses and help him overcome them. To assess the strengths and weaknesses of your team member, ask yourself the following questions pertaining to each area of his work. The answers to these questions will become the parameters to assess him. They will also help you prepare an action plan for yourself as well as for your team member. The objective of this topic is to introduce you to the nuances of marketing. An understanding of its various aspects will help you appreciate the hard work that your marketing team carries out in order to support your activities. The marketing and the field teams are interdependent and both will be immensely benefited once they have proper coordination. Strategies that are designed keeping in view the field requirements and suggestions help improve in-clinic performance and therefore improve the results in terms of sales output. The field team feels motivated once it starts getting inputs such as samples, gifts and sponsorships according to their requirements/suggestions. A reduced response time as a result of better coordination between the two teams leads to better customer service. For example, prompt answers to medical queries and timely dissemination of appropriate and latest information to doctors would be beneficial. The latest information in terms of the competitors' activities would help review and modify promotional strategies including pricing decisions. The feedback on the organisation's own strategies helps in improving the quality of inputs such as samples, gifts and sponsorships which result in enhanced customer satisfaction (internal). The timely response to the medical fraternity by way of answers to their medical queries and by providing appropriate/latest information leads to enhanced customer satisfaction (external). Better coordination between both the teams helps the marketing team identify core customers for each brand and also to take corrective steps wherever necessary. Marketing is an umbrella term. The whole gamut of marketing activities starts with planning the marketing strategy.